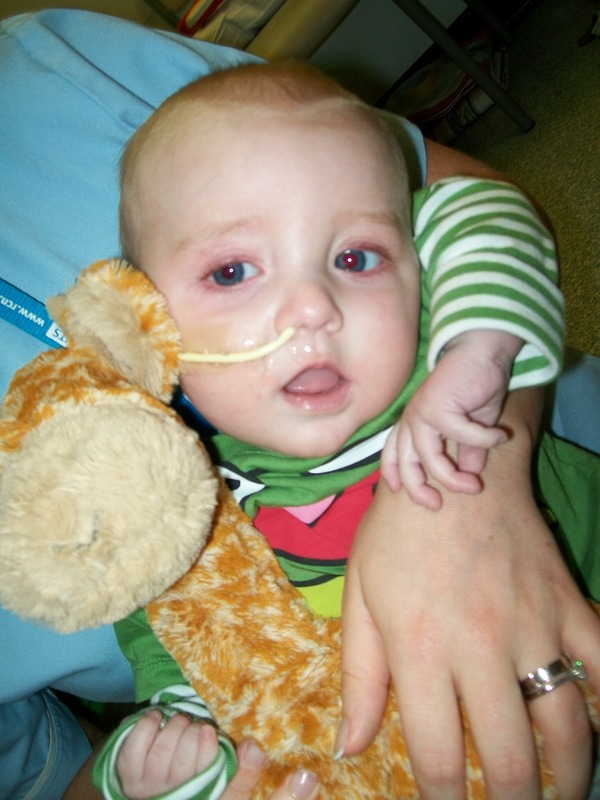 At the end of the last history we had just been given the news that Seth had SCID. How do you respond to that? Well if I’m honest I didn’t know what to think. I’d never heard of immune problems, nevermind not having an immune system at all, and the consultant said it just needs a bone marrow transplant….easy right?! They will fix the infection, and send him off to Great Ormond Street who will give him the bone marrow and we’re sorted right. Oh wait a minute…this is what I’ve heard about time an again since being a child – no match for bone marrow, and people doing massive world-wide campaigns looking for a match? But whilst all this is going through my mind, there’s a feeling of relief – I’m not a rubbish mum who can’t cope with a simple baby! However selfish it may seem, I felt it. Now we know what it is we can do something. Hurrah! So first things first, he needs to get better. At the time he was on an oscillator. This is a huge frequency type of ventilation, so effectively it uses little puffs to breathe for the patient, keeping their lungs open (give it a try quick short breaths you will feel that your lungs don’t fully close). More conventional ventilation requires the lung to open and close, therefore requiring more work. 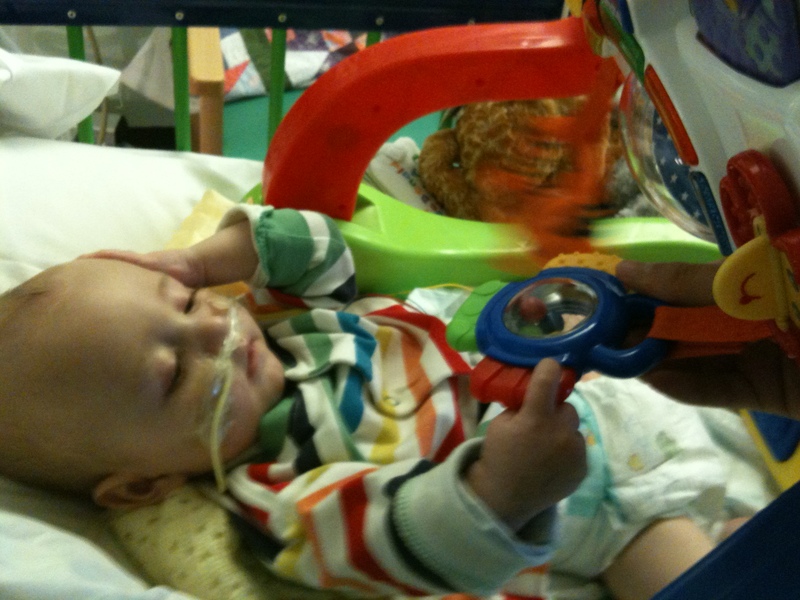 Seth wasn’t coping with normal ventilation, so oscillation it was. They wheeled out what can only be described as a washing machine from the 70s, and they confirmed that in fact it was from the 70s. It sounded like a steam train sat in a station….but it worked! 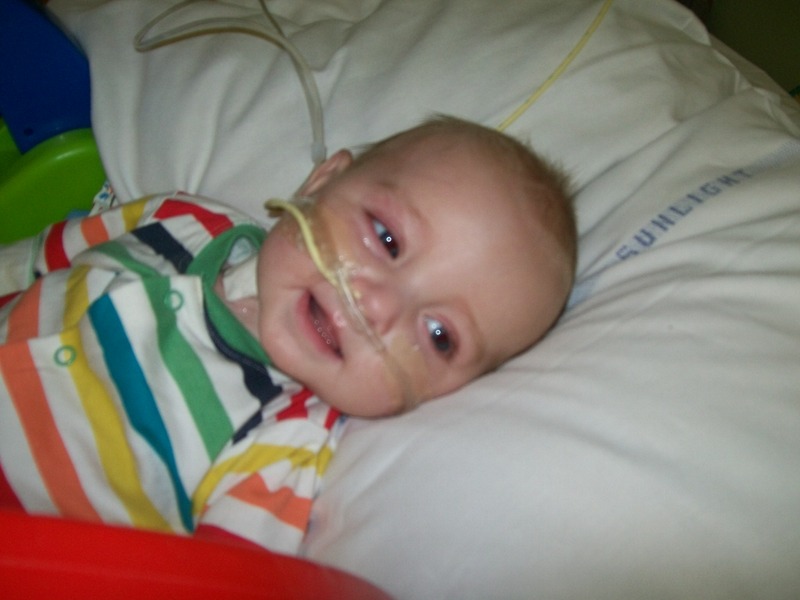 Within 24 hours of being on it Seth was coping, he was maintaining an acceptable oxygen level and his heart rate and pulse had improved – he was more relaxed. After this first week my mum went home as she had to return to work, and Nik also had to go back to work, He visited straight from work until 11pm but the rest of the time I was on my own, watching Seth’s monitor, doing his cares (wiping the inside of his mouth with a wet sponge, putting his eye drops in), and waiting for daily bloods to see what his infection marker was doing. He was improving. Every morning the consultant did their rounds and parents had to leave, but they let me stay and be part of the discussion about Seth’s progress. They’d always ask me how he’d been over he last 24 hours. On the Monday morning he was moved back onto conventional ventilation. 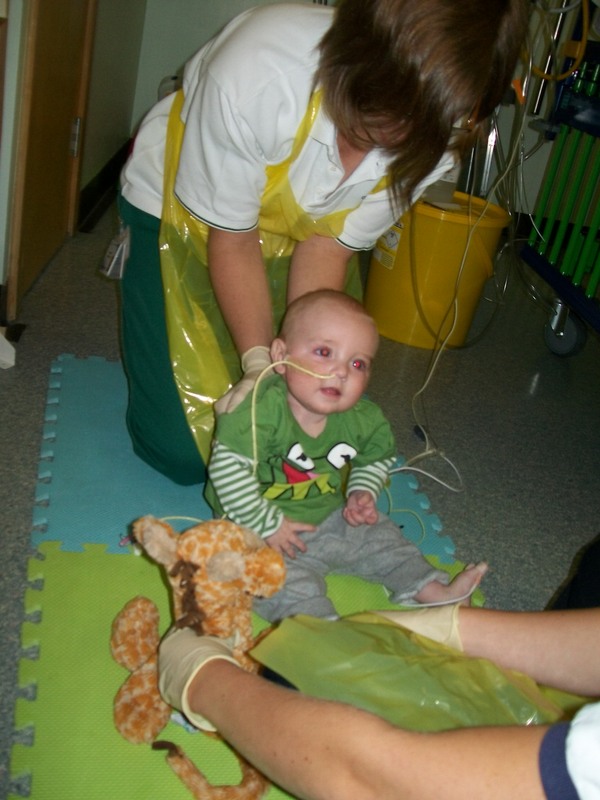 But he struggled, he had to have very high pressures to keep his oxygen levels up. But in the afternoon the next day (1pm- it’s funny what seemingly irrelevant details you remember!) they felt he was well enough to be taken off ventilation. They warned me that it may not work and he will need assistance from other measures. 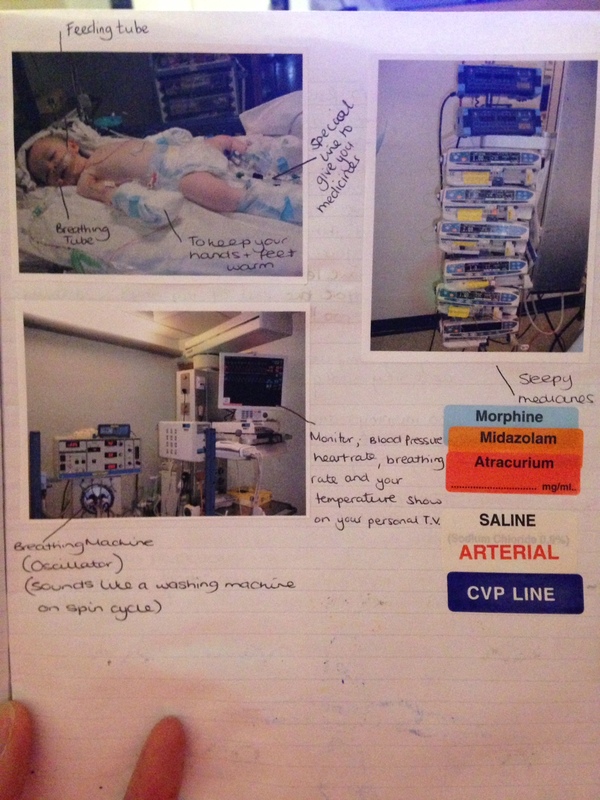 He did need other measures, he couldn’t manage on his own at all and was put on a type of ventilation CPAP (continuous positive airway pressure) which uses low pressure oxygen to keep open the airways making breathing easier. I hated it. He hated it. 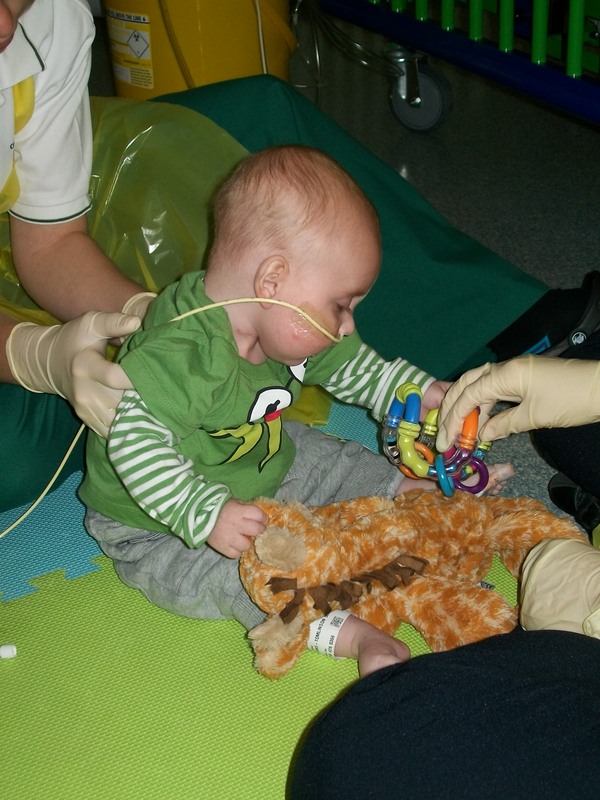 The docs and nurses were saying it can take time for him to get used to it but I struggled to watch him, he was struggling, he wouldn’t settle, he was making this whimpering noise. I hated it. I got to hold him, but only for 2 minutes as he struggled. Nik came as usual that evening and he got to hold him, but for longer. I felt so jealous! It’s ridiculous but I was desperate to hold him. I had to leave and come back later. 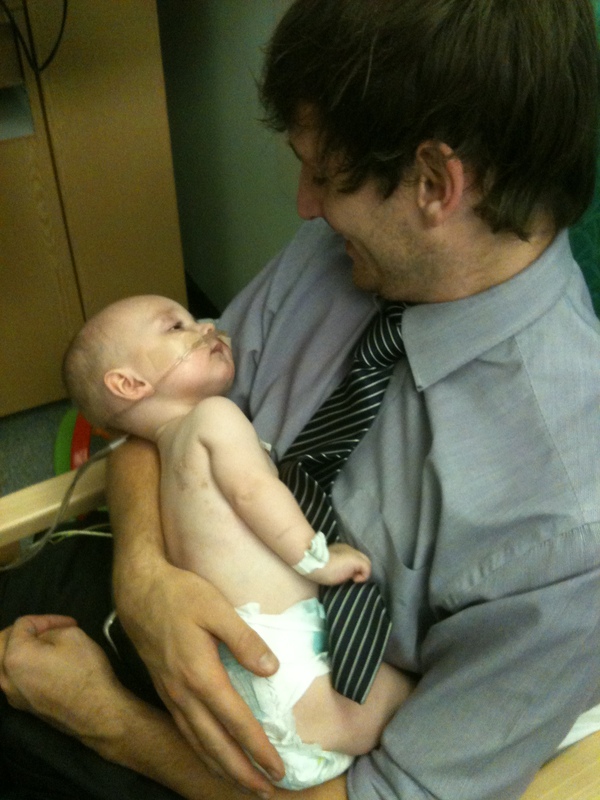 The nurse had noticed and let me hold him again, so I felt bad… It was silly really I’d been with him the whole time. I made Nik stay with me that night, he wanted to go home – it was fair he did have work in the morning, but I made him stay. I’m glad I did, at 3am there was a knock at the door. Our room was across from intensive care. It was a nurse. 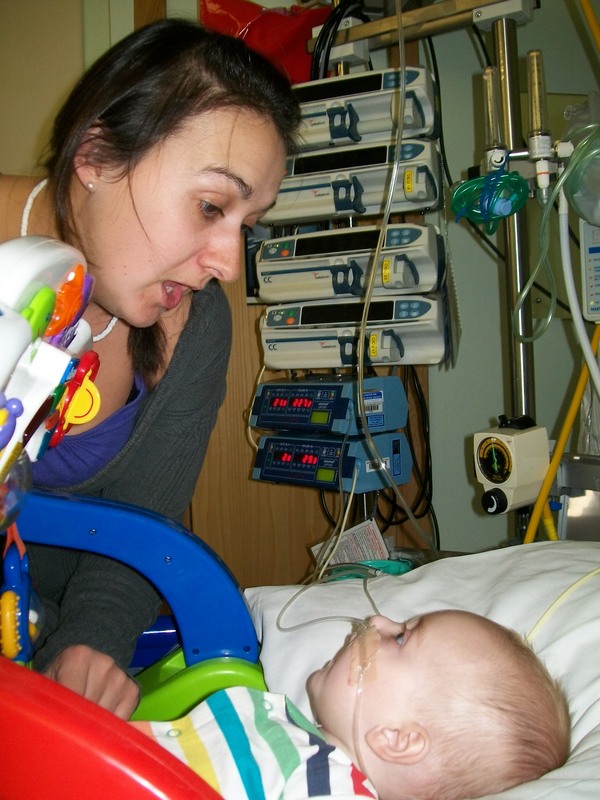 When your partner opens the door at that time to a nurse with a sad-looking face when your baby is in intensive care, you don’t tend to think all is well…and it wasn’t. 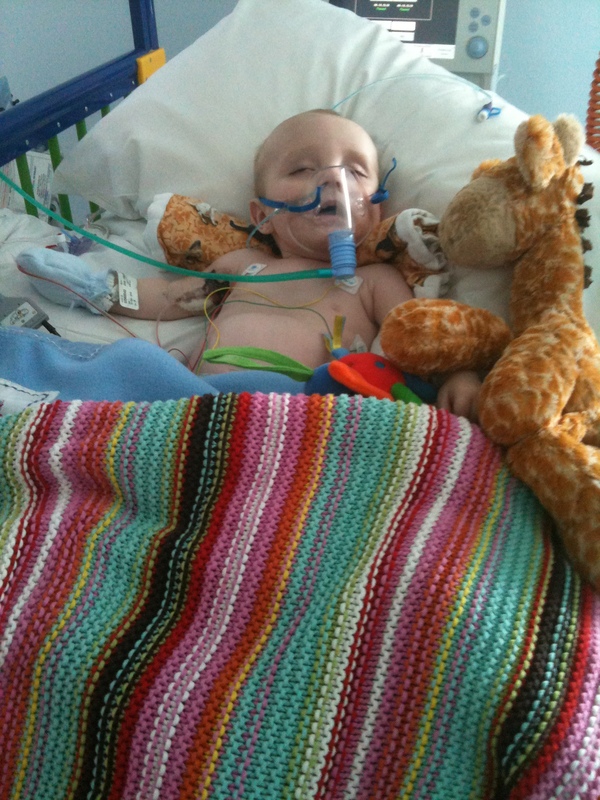 He’d failed and had to be resuscitated again, they’d struggled to get him stable, again, and he was back on ventilation. We went to see him and the faithful chugging of the oscillator had returned. It was comforting. In my mind he was safe. 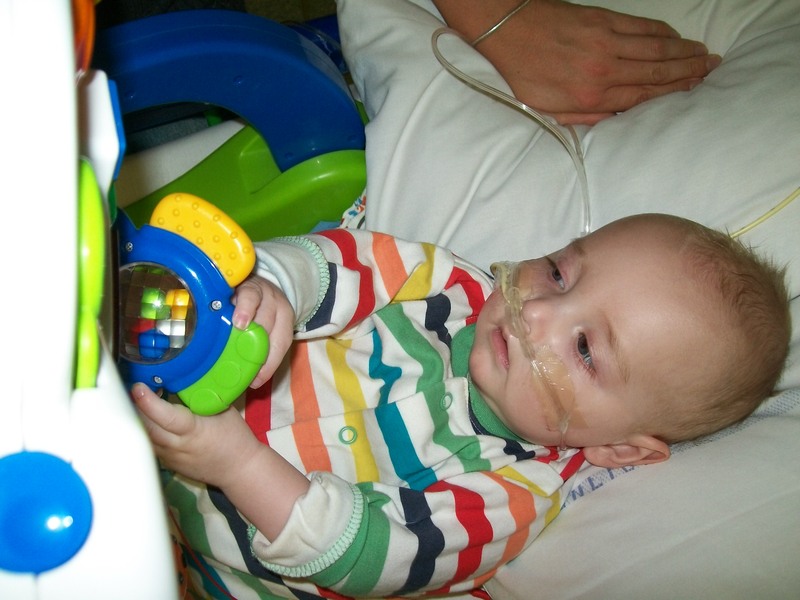 The next day was another difficult one, he had to have three chest drains fitted throughout the day because his lungs kept puncturing, and when the evening came, he had two fits. This was harder than I thought. I’d coped up until now. But I was alone again, and he wasn’t getting better. I struggled this week and withdrew. Seth went for a CT scan on his brain which showed he’d had a stroke and was left we two small bleeds on the brain, and his lungs kept puncturing so he now has 5 chest drains. It got to the weekend and he was still struggling, Nik was there and I didn’t want to go and see him. I thought he was dying and I didn’t know what to do. The ward sister came to see me and said a few things but I remember she said “we don’t know where we’re going with Seth right now, but he’s still here and we still have options”. I cried. I slept. and then I was ok again. Obviously I wasn’t happy or joyous…but I was back coping. 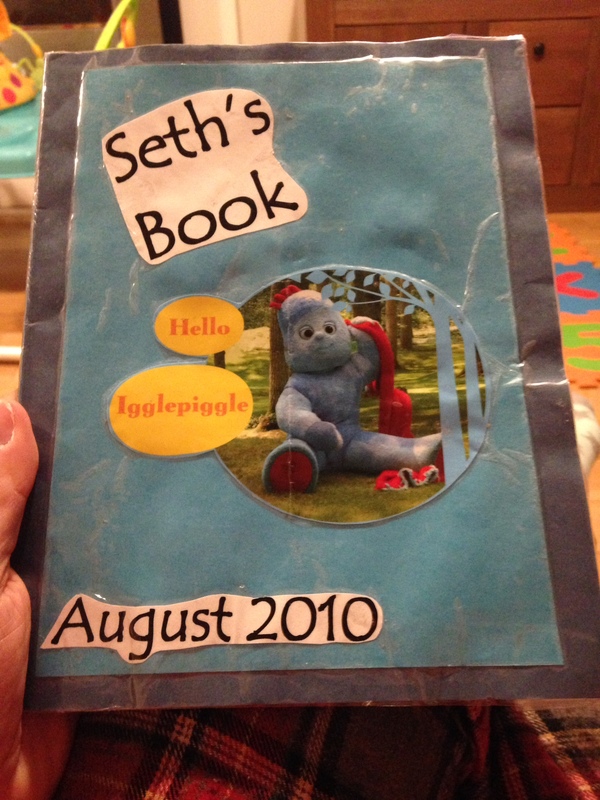 It was as if Seth knew…he then started to improve everyday. The nurses would send me out for a walk for an hour a day. It helped, but sometimes i would become a bit of what i refer to as a ‘pram kicker’ (internally of course – i didn’t go round sticking peoples prams, I’m sure that would be at the very least frowned upon! it means that i would momentarily resent people wandering round the shops with their healthy children) Small steps and sometimes he took a few back wards steps, but the overall trend was in the right direction. 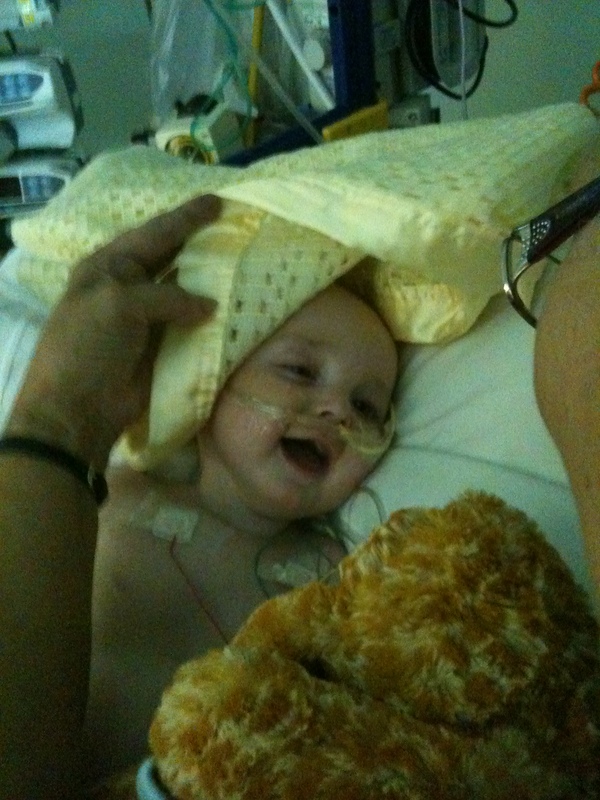 Another 2 weeks later they took him off the ventilator again and brought him out of the coma. 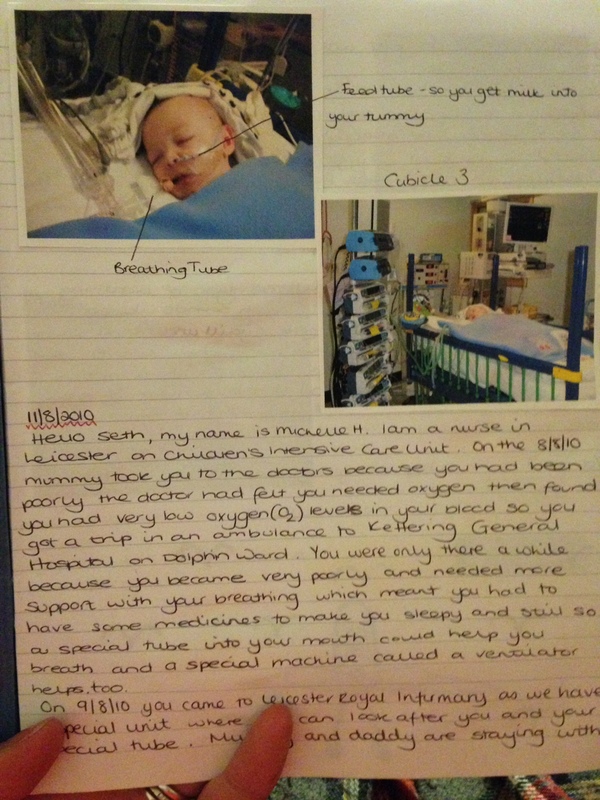 He coped this time – and didn’t need CPAP! 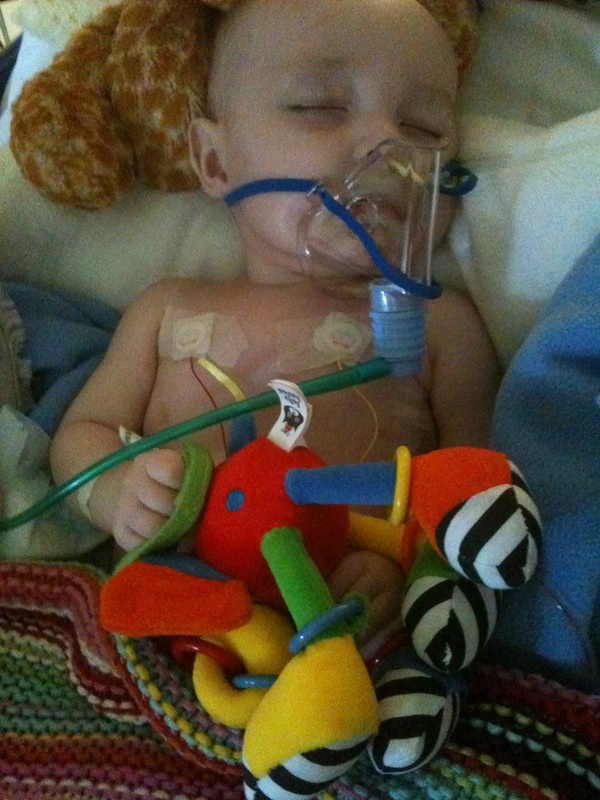 He needed oxygen of course but not the horrible CPAP. As he started to recover his personality came out. He charmed every one of the nurses- who incidentally were brilliant the whole time we were there. They learned about SCID so they could answer our questions. One day I was ill so had to stay away from Seth. He was on his own. The next day they showed me LOADS of pictures of them playing with him all day!!! 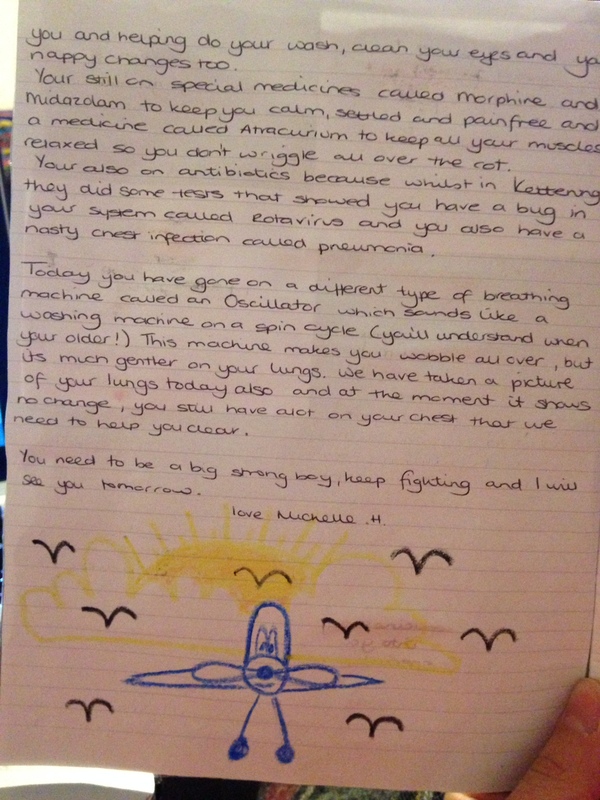 Also everyday that he was there they filled in a diary about his day (see pics below) it was amazing and although it was an awful time we really like having it. It is written to him so he can understand when he is older. 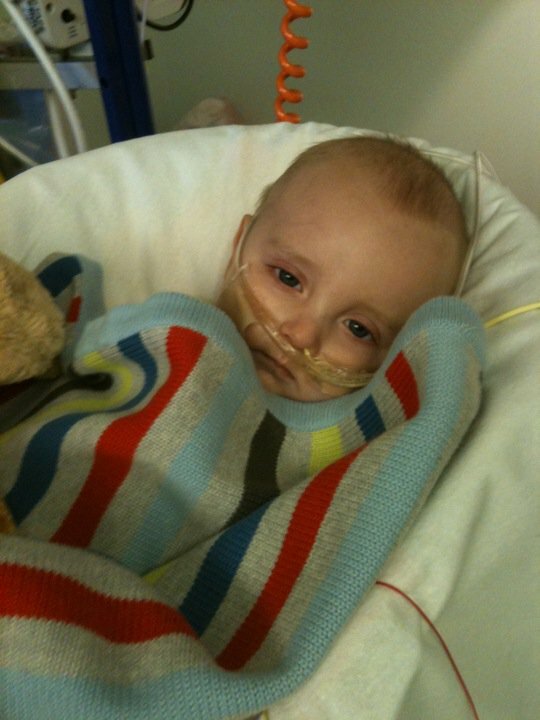 6 weeks after first being admitted he was ready to be transferred to Great Ormond Street. He was still very poorly so we had to have an emergency ambulance there. 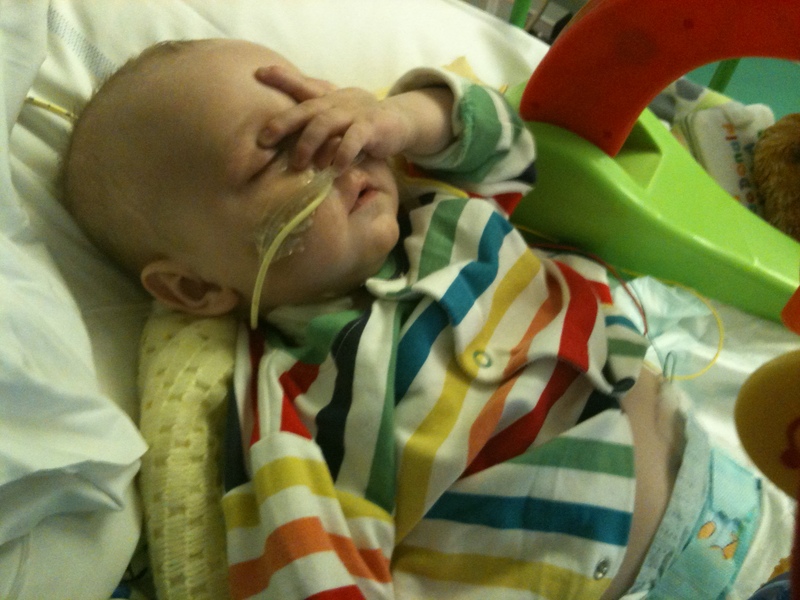 But we were going to the mighty great ormond street! They fix the unfixable. It’s all going to be fine! Seth, what a precious baby you were and an even more handsome sweet little boy. Praying for you in Little Rock, Arkansas USA. You are all such a strong family. 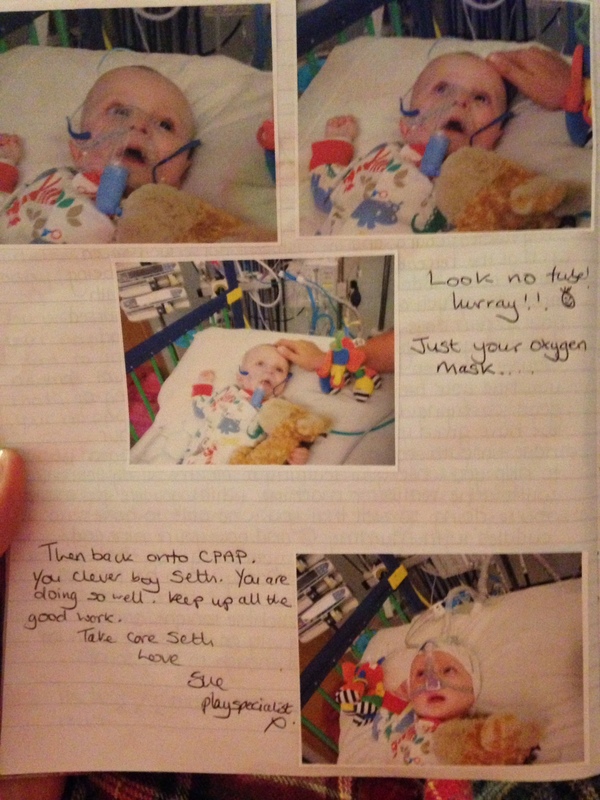 Seth is one incredible boy. I hope everything works out the way god intends it to. It is so heartbreaking to read about this! He is truly the most adorable kid! And you are a true super mom! I admire you so much! Yes, most parents would have been able to deal with it if they had to, but you have a very special way of doing it! You are honestly a true “hverdags helt” as we call it here in Norway, meaning a everyday hero! Stay strong! And give Seth some kisses from Norway! Hi Seth my name is Bryana and I’m am so happy that I read about you, I am so sorry of what you have to go through but I paryed that god heals you, and I hope you believe he can heal you and to the parents I am sorry that u have to go through this but u go through things for a reason and good would come out if it just let god do his work at healing him in and out. I am very inspired, because even though y’all are going through problems y’all still keep y’all head up and a smile on you guys face. Now I know when I go through thing or when this get to hard to handle that I can see what y’all have to handle and know that everything is going to be alright. This story got me really sad and crying but I am glad he’s getting better each day. Again my name is Bryana young I am 13 years old and I live in Altanata Georgia, you and your family is in my prayers I hope you guys will get a miracle and a blessing that you been hoping for. He’s so precious. Very inspirational, and very strong boy. I’m in love with him! I admire your strength. God does not give us more than we can bare! You and your family are a testimony to that. 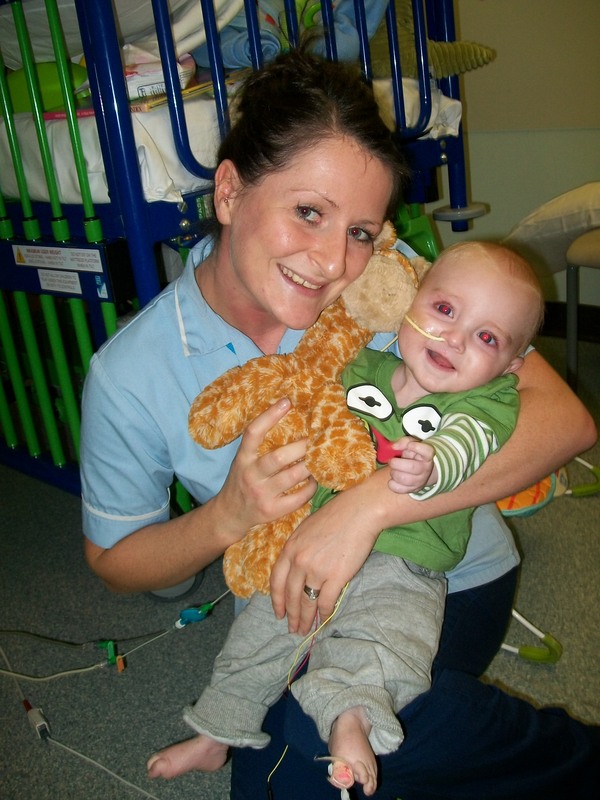 Iamaretired nurse and I now spend my time making pillow cases for sick children like Seth. I work thru area hospitals generally but, I very much would like to make Seth a “Yellow” pillow case with his favorite character or characters. Thank you. I made this Card for you Seth because you have brought so much joy to millions of us with that beautiful smile of yours! You’re like a Sunflower! You’re really good with those cards introducing yourself to us too! I loved your demonstration and I’m with the rest of your new friends saying Get Well Soon and we love you, Mummy and daddy, because you are all so brave!!! I’ve been looking for an update on Seth’s surgery but can’t locate anything, maybe tomorrow. Still saying prayers, love, and hope for a speedy recovery! ???? Any updates on Seth? I think about Seth and his family every single day and have a picture on my Fridge to remind me that I have no problems at all. This amazing Family, and now with Seth being a Big Brother it seems like time has flown. Seth’s smile would melt a Glacier and the brave heart this young boy has is beyond amazing. He is truly an example of courage, tenacity, and he radiates being loved, which means wonderful people are around him. God Bless them each and every one. I look forward to my Seth and his Family Emails! 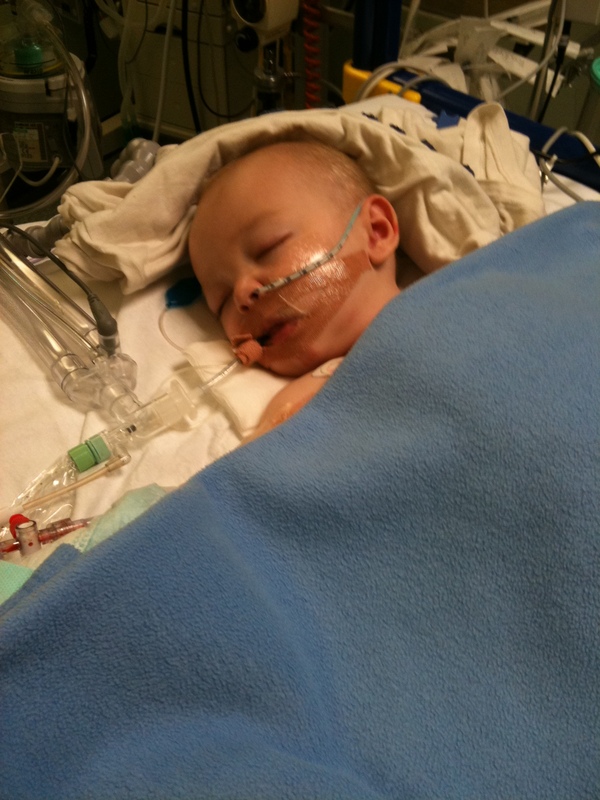 My oldest son was diagnosed with Cystic Fibrosis and was in ICU nine times before he was two years old. We came so close to losing him so many times but he’d been misdiagnosed and given not only the wrong medications at Martin Army Hospital but he was given too much and it rendered him Sterile and with “minimal” brain damage. Today he is not 100%, but who is. He’s has tenacity, like Seth, that you can’t believe. God sends Angels to us that need special care because he knows we care. 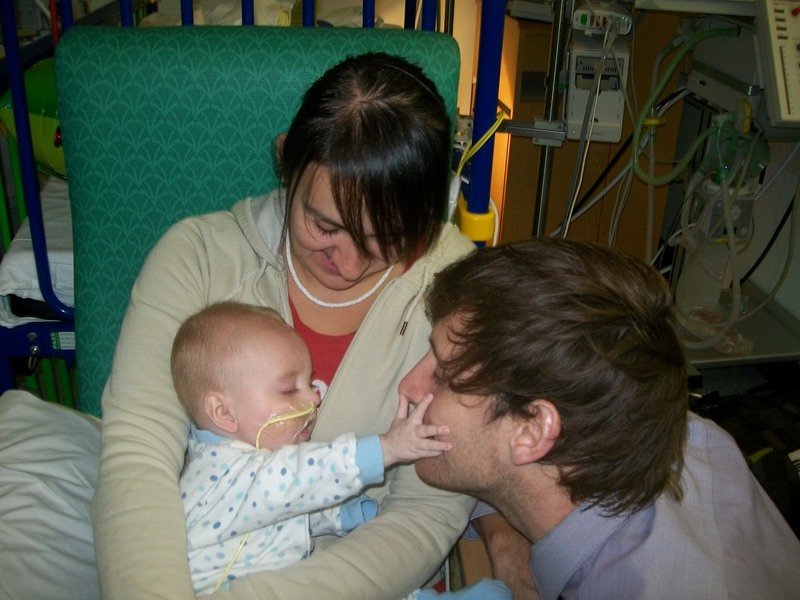 Seth, Hugo, and his mom and dad are such an inspiration to all of us to love and hug often, and daily. ❤ Love and (((((( big hugs )))))) to them all! Goodness what a journey you’ve been on. So glad your through the other side and we wish you a further of happiness. Thanks for your support.